On this Sunday, we commemorate the Parable of the Publican and the Pharisee, from the Holy Gospel According to Saint Luke (18:10-14). For Christ is within, He Who accepteth the humble. And the Triodion from mankind. Today, by the Grace of God, we begin the Triodion, which many of our Holy and God-bearing Fathers, who were skilled in writing music, under the inspiration of the Holy Spirit set to excellent and appropriate melodies. First of all to devise the three odes, patterned after the Holy and Life-Creating Trinity, was the great poet Saint Cosmas, for the Great and Holy Week of the Passion of our Lord and God and Savior Jesus Christ, composing his Troparia with acrostics based on the name of each day. 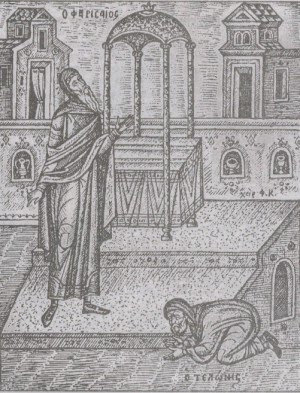 On this basis, the other Fathers — and more than anyone else, Saints Theodore and Joseph the Studites — in imitation of Saint Cosmas wrote three-ode Canons for the remaining weeks of the Holy and Great Lent, which they handed down to their own Monastery of the Studion; they arranged and metered the Odes to a greater degree, collecting and assembling the rest of the book from whatever Patristic sources were available. Since the first day of the week is Sunday, the day of the Resurrection, and since it is both the first and the eighth day and the last day, they very wisely appointed the First Ode to be read on Monday, the second day, the Second Ode on Tuesday, the third day, the Third Ode on Wednesday, the fourth day, the Fourth Ode on Thursday, the fifth day, the Fifth Ode on Friday, the sixth day, the Sixth and Seventh Odes on Saturday, the seventh day, as well as the two others, the Eighth and the Ninth, which all of the days have in common as being the most important, just as the Divine Cosmas did in the case of Great Saturday, for which he composed a four-ode Canon; it was later made into a complete Canon by Bishop Mark of Hydrous, at the orders of Emperor Leo the Wise. It is not entirely accurate to call the book the Triodion; for it does not have three-ode Canons throughout, and indeed it contains complete Canons as well; but I suppose that it received its name either from the fact that it has more three-ode Canons than complete Canons, or because the Canons of Great Week were written first, as we have said. 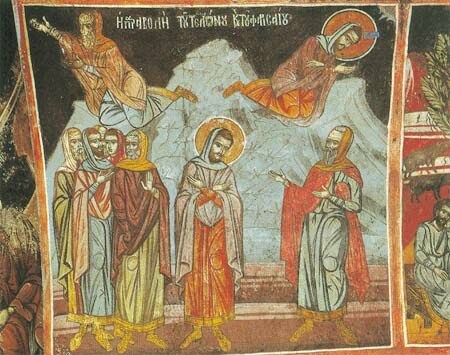 Now, for our Holy Fathers, the purpose of the entire Triodion was to remind us in brief of God’s benefaction to us from the beginning and to instill in the memory of all how we were fashioned by Him, and how we violated the commandment which He gave us for the sake of our nakedness; how we were banished from the delight of Paradise and expelled through the envy of our enemy the serpent, the Author of evil, who was brought down on account of his pride, and how we remained outcasts from the good things of Paradise and were led around by the Devil; how the Son and Word of God, moved by compassion, bowed the Heavens and came down, dwelt in the Virgin and became man for our sake, and through His own way of life showed us how to ascend back to Heaven, through humility, fasting, and refraining from evil deeds, and through His other actions; how He suffered, arose, and ascended to the Heavens, and sent forth the Holy Spirit upon His Holy Disciples and Apostles; and how He was proclaimed Son of God and perfect God by them throughout the world; what the Divine Apostles accomplished through the Grace of the All-Holy Spirit; and that they gathered together all the Saints from the ends of the earth through their preaching, replenishing the world above, which was the goal of the Creator from the very beginning. This, then, is the purpose of the Triodion. 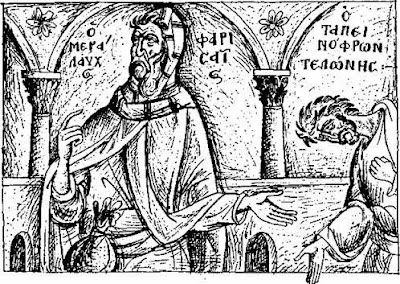 The present three Feasts, of the Publican and the Pharisee, the Prodigal Son, and the Second Coming, were devised by the Holy Fathers as a preliminary exercise and an incentive to prepare us and make us ready for the spiritual arena of the Fast, by leaving behind our customary and loathsome habits. First of all they set forth for us the Parable of the Publican and the Pharisee, and they call this week the Proclamation. For, just as those who are about to depart for physical combats learn in advance from their generals the time of battle, in order that they may clean and polish their swords, and make all the other due preparations, and, removing all impediments, may eagerly strip down for the contests and procure what is necessary; and, just as, prior to encountering the foe, their leaders cite accounts, stories, and examples for them, stimulating their souls to zeal, and warding off hesitation, cowardice, laziness, and whatever else is hazardous; so also, the Divine Fathers signal beforehand the forthcoming battle, through fasting, against the demons, in order that they may cleanse us of any passions that are lodged in our souls and of any poison that has been at work in us for a long time; and, furthermore, in order that we may hasten to acquire whatever good things we do not have and, properly armed, may thus advance in readiness for the contests of the Fast. Since the first weapon that we need in order to acquire virtue is repentance and humility, and since the greatest obstacle to its acquisition is boasting and pride, the Fathers set forth the present trustworthy parable from the Holy Gospel first of all. By means of the Pharisee, they urge us to lay aside the passion of boasting and self-conceit, and by means of the Publican, on the other hand, to seek after humility and repentance, the opposite of this passion. For, since boasting and self-conceit are the first and worst of the passions, because thereby the Devil fell from Heaven — he who was formerly called the Morning Star and who, through his pride, became darkness and was called by that name — and since Adam, the father of our race, was driven from the Paradise of delight on account of pride, the Holy Fathers exhort us, through these examples, in no way to boast of our own accomplishments or set ourselves up against our neighbor, but always to be humble; for “God resisteth the proud, but giveth grace unto the humble.” It is better to return, having sinned, than to be puffed up after achieving something. For “I tell you,” says the Lord, “the Publican went down to his house justified rather than the Pharisee.” The parable, therefore, makes it clear that we should in no way be puffed up, even if we do good things, but should always humble ourselves and pray to God from the heart, even if we have fallen into the worst of evils, for we are not far from salvation. The Publican was one who collected taxes from the rulers and purchased the farming of taxes in an utterly unjust way, and profited thereby. A Pharisee was one who supposedly set himself apart and surpassed everyone else in knowledge. A Sadducee was a descendant of Sadok, the high priest who assisted David against Absalom. Sedek meant righteousness. There were three heresies among the Hebrews: the Essenes, the Pharisees, and the Sadduccees, who did not accept the resurrection of the dead, Angels, or spirit. By the intercessions of all Thy wonderworking Saints, O Christ our God, have mercy on us and save us. Amen.